Melt butter and put and place in a baking pan. Set Aside. Put down a piece of parchment paper and sprinkle some additional baking mix on your working surface. Flour your hands and shape the dough into a 9 inch square; 1 inch thick. Cut dough with a knife or pizza cutter into 9 squares. *Note – Flour your cutting utensil after each cut. Place the biscuits into the baking pan on top of the melted butter. Bake in the preheated oven until biscuits are golden brown, 12 to 15 minutes. 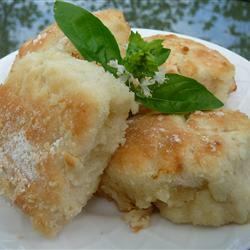 Let biscuits rest for about 5 minutes before serving. Posted on May 28, 2013, in Lady Fab Cooks and tagged 7-Up Biscuits, breakfast, brunch, dinner, food, lunch, recipe, sugar fairy bake shoppe, The Rays Of Sunshine. Bookmark the permalink. 2 Comments. This looks really good! I’m sure kids will love it just as much as adults! My two favorite food items…..lemon lime and biscuits. Yummy!!!! !